“And the rains came…”, but not for 40 days and nights, at least not yet. Orchid growers in Florida experienced many days of torrential rainfall from Tropical Storm Fay, but similar weather events, i.e. many days of rain or gloom can happen anywhere or any time of year. Of course, orchids growing in Nature also experience extreme events. The difference, however, is that your orchids have been put into pots, grown in material that confines their roots, and locked in a relatively contained atmosphere. Compare a “free range” orchid to its citified relatives and it is easy to see why the same event could lead to such different results. Days of rain and wind would soak the roots and leaves of a wild orchid, bringing bits of new leaves and twigs where they can rot and release nutrients. The movement of wind and water across the roots and leaves would wash rotten materials away and remove fungal and bacterial spores from the plant. Orchids in a greenhouse are likely in a closed environment where humidity is high and air movement nil. Most greenhouses vent during the day when exhaust fans rapidly replace the air in a greenhouse. When venting does not occur, the air becomes filled with bacterial and fungal spores that settle on orchid leaves and in pots. No matter how clean and neat your growing area; there are plenty of bacteria and fungi around to infect orchids. While my immediate thoughts relate to a hurricane, the same basic conditions occur during winter storms or even just during a series of very cloudy days and little sun. Your pampered orchids have roots in pots that just barely have enough air space to allow oxygen to the roots. In a greenhouse full of orchids and other plants, oxygen levels actually decrease too, making roots even more susceptible to death. Plants rarely die from low oxygen levels, but parts of plants, especially roots do die where they are very susceptible to invasions by bacteria and fungi. 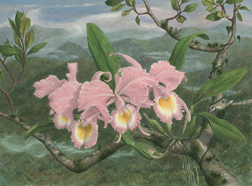 Plants, including orchids, use oxygen. It is only when light is striking leaves that photosynthesis leads to the production of more oxygen than the leaf uses. Fungi and bacteria love high humidity and low oxygen levels and so every grower should expect problems after prolonged periods of damp, humid conditions. About the only time I recommend the application of a broad spectrum fungicide/bactericide as a preventative is when a major rain event is going to occur or right after it occurs. Indoor growers need to pay attention too, as the same phenomenon can occur when you water your orchids and your light source stops working for a day or so. There are many products that can be used. My favorite is Kocide, an old copper-based product. Kocide leaves a light blue sheen on leaves so you know it has been applied. My strategy is to apply as soon as possible after the event at half strength and let the orchids and greenhouse vent and dry thoroughly before watering. Rarely, do I experience a disease problem. Physan is another, readily available product that many hobbyists use. Some tender leaves can be damaged by the recommended dose for orchids, but the half strength dose rarely causes any problems. It is also a surfactant and helps move water off leaves and stems. Killing disease spores, increasing air movement, and quickly drying your orchids and greenhouse is the best way to prevent problems after a major environmental event.